If you’re a visual artist or photographer, your image is your brand. Literally. You’re known for what you present, and when you present a focused body of work with a theme, or a recurring topic, or a continuing concept, or an identifiable style that’s unique to you, you’re more likely to get known. In a world of endless creativity, with everyone a smartphone artist, there’s a clearer need than ever to present your image in a polished, professional context. 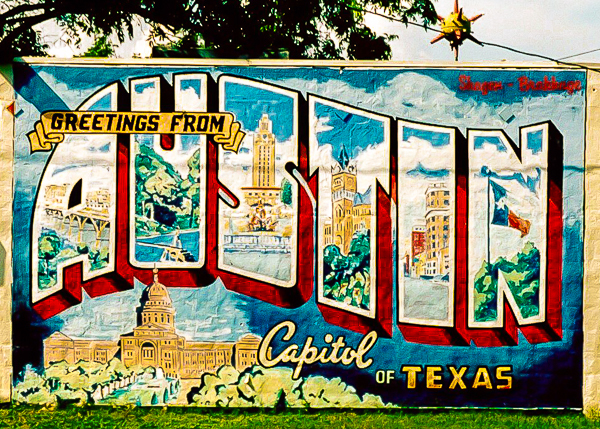 Branding 101: If you’re known for something (like I am for Vanishing Austin), use its image over and over again, relentlessly. It’s your brand. Your resources and energy for presenting your image are limited too, even as the options seem to multiply daily. That’s because you probably want to focus your creativity energy on the art or photography you make, and not so much on your brand. So you’ll need to make informed choices about the avenues you pursue to present your image. You can default to the ease of sharing your portfolio pieces to your friends on Facebook, where you’ll receive praise and encouragement. You can upload hundreds of photos to Flickr to be lost in the Flickrsphere. But have you evaluated how those choices further your art career, or make photography sales, or get you commissions and assignments, or even give you a reasonable ROI? 1. Your image is your brand: what you present is what you become known for (and you must guard your image, nurture it and tend to it). 2. Presentation is everything. What you show the world is what you’ll get known for. Presentation is everything. What you show the world is what you’ll get known for. 3. Your art portfolio doesn’t need to ever physically leave your studio, but the act of creating it will focus you and your work. 4. Your web portfolio is a must-have, in the way a business card once was—it’s your calling card for the world, and the way you’ll be introduced over and over again. 5. Your business card is still a necessity. You’ll probably print more than you’ll ever need, but your card must be polished and offer all of your contact options—then you can just hand them out like candy. 6. You’ll need some promotional cards. One for each subject or theme you pursue will offer a quick visual reminder to your various audiences about what you do and what your focus is. 7. You work can get a boost in attention when you present it on your iPad. (But not on your iPhone—see Dumb Things Artists Do if this is not self-explanatory.) You can make a short presentation for each body of work, using Keynote on your iPad, and ride the coattails of the iPad‘s popularity by offering it to a client you’re wooing. 8. Your art and photography will be shared again and again when you create a slide show (or Keynote or PowerPoint) and upload it to sites like Slideshare or LinkedIn. 9. Everyone else has a video. You need one too. Or several. The better to see you with, my dear. 10. Have a one-page PDF handy to email anyone, anywhere containing your professional highlights and contact info at a glance, and include an image, too, of course. The one that promotes your brand. FIND OUT MORE ABOUT MY BRAND HERE. Design Is for Function. Looks? A Bonus.